As a professional office supply manufacturer in China, we are able to provide a variety of office supplies such as stapler, desktop set, paper punch, pencil sharpener, etc. This is our whiteboard marker, you can find other similar products of different functions by clicking the below icons. Welcome you to browse and choose! 1. White pen-holder and round pen-nip design. 2. The ink marks are easy to be cleaned and are traceless. 3. Writing marks will be dry in 30-40 seconds and can be cleaned in 30 days. 4. The pen cap can clip on the whiteboard marker, so the marker will not roll around. 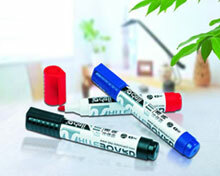 Our Whiteboard Markers (whiteboard pen) are suitable to write on various whiteboard and plastic products. Deli Stationery, as a professional stationery supplier, can provide a variety of office supplies. Welcome to choose our office products.